Quick and easy recipe for raw dairy-free milkshake that is delicious. It contains loads of nutrition – a few portions of fruit, healthy fats and protein from the nuts. Deep flavour from the cocoa / cacao. It’s the perfect mix of sweet, bitter and creamy. 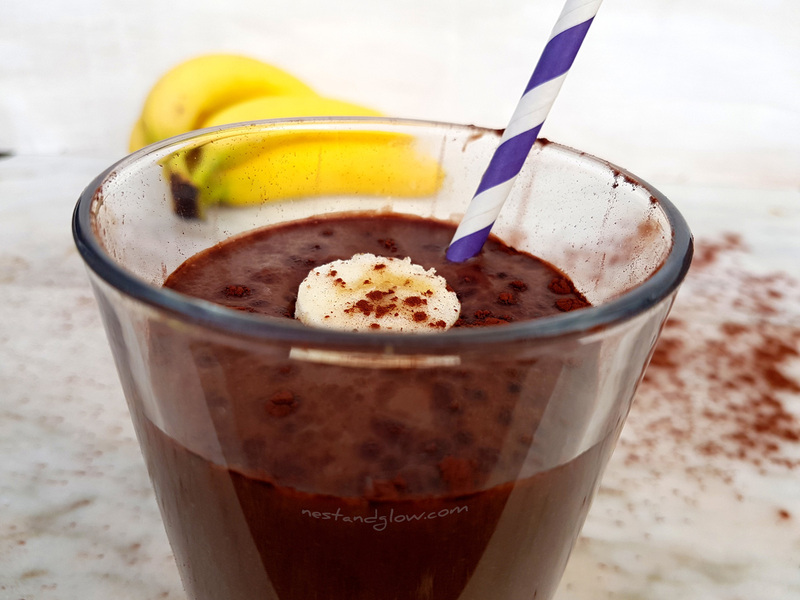 A glass of this will wake you up and keep you full until lunch. Suitable for vegan, dairy free, gluten free, plant based and general whole foods healthy diets. Perfect if you are trying to give up a morning coffee, and are used to the very sweet flavoured coffees that are loaded with sugar syrup. 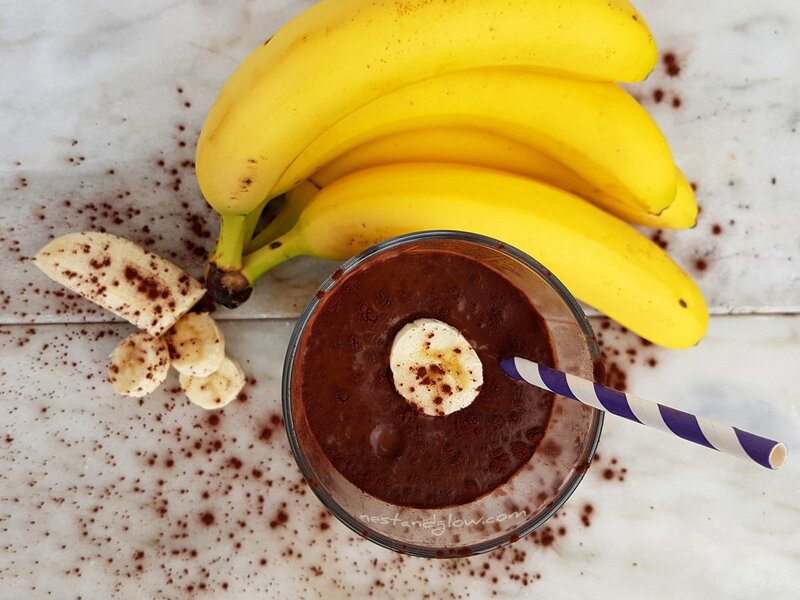 All the sweetness from this milkshake comes from fruit. Normal dates are used in this to give a sweet fudgy flavour, just make sure that they have been pitted. I deliberately don’t use any pre-made dairy free milk as it’s expensive, often not that healthy and usually very low in nuts / seeds (almond milk can be <1% almonds). It saves time just blending everything together in one and no additives or nasties are added. Hazelnuts blend smooth in my standard 600w blender and give a rich creamy dairy free texture. Full of heart healthy fats. Depending on how much you like cocoa / cacao add 1 or 2 tbsp. I like a dark and slightly bitter chocolate milkshake so add two heaped tbsp. If you prefer a sweeter milkshake just add 1, then taste as you can always add more. Place everything in the blender and blend until it’s smooth. You will hear the difference when all the nuts have been broken up. 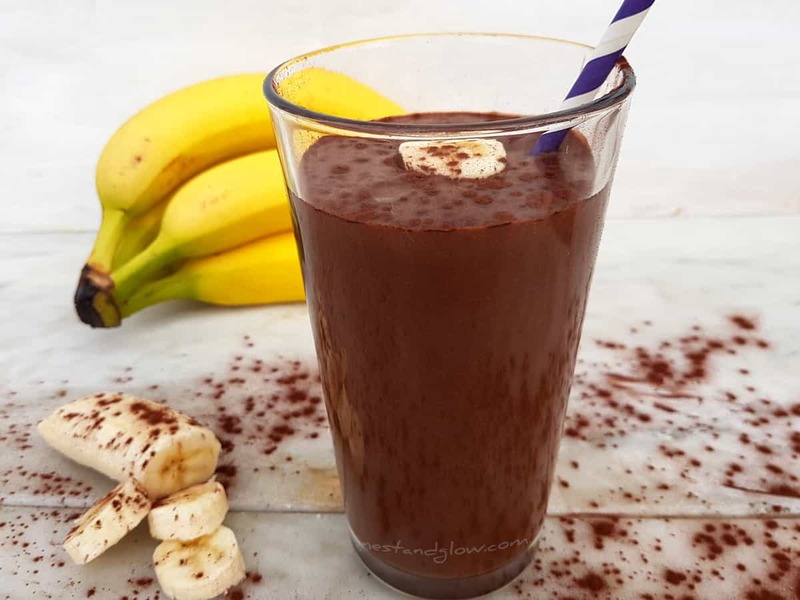 Drink as soon as it’s made, garnish with a sprinkle of cocoa and a slice of banana if you like. To make it more fudgy add more dates, I often do this before a big day when I need the energy. Thank you so much for these inspired and yummy recipes. I was attracted by the smoked cashew cheese and then those sweets really mesmerised me – lol. I want to eliminate refined sugar and cheese from my diet (-deep sigh) and I am happy I have found these alternatives. I will definitely give them a try. Once again, big thank you! Hi there, I think it’s less sugar than that – it’s just from two bananas and a handful of dates. That’s for the full pint and I don’t think anyone would have that in a sitting! the sugars are just from the fruit – dates and bananas. They come with fibre and vitamins. Sugar isn’t always a bad thing if it’s natural, what’s bad is refined and stripped of everything but pure sugar. I do worry about these days where people are demonising whole fruit as an unhealthy thing.